It doesn’t matter if it’s a three-course meal on the grill, a simple barbecue, or an impromptu picnic, summer outdoor eating lends a magical feeling to food. Even unwrapping and eating a popsicle, trying to keep up with its melting, is such a treat. And because I like to get out and go, energy bars are always a convenient and oh-so-portable option for heading off to the park or making longer treks by plane or car. When I’m hungry and busy, and there is no other food in sight, an energy bar eaten on a park bench in the sunshine exceeds haute cuisine. I’ve written recipes for energy bars in past posts, including my rendition of homemade LARA bars, but the other day I decided to tackle another of my favorite ready-made bars, Clif bars. I like them a lot, and so does my husband, but the $1.69-per-bar cost is a bit much considering how much we like to have them around. 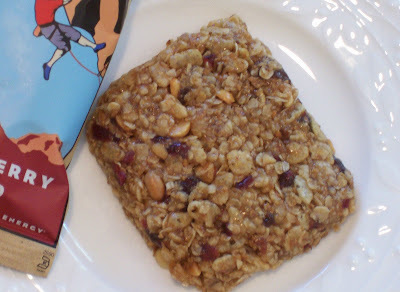 Clif bars are chewy and soft, similar to an under-baked oatmeal cookie. Looking at the ingredients list on the wrapping, brown rice syrup and oats are two of the main ingredients in all the bars. Also on the list are some scary scientific additives that I’d rather do without, along with a weird soy aftertaste. So rather than add any soy protein powders or the like, I decided to keep the ingredients simple and readily available (as well as pronounceable). I tried a baked option first, combining several recipes into one and swapping out a number of the ingredients for high protein nuts and some whole grain. I was thinking I could under-bake the bars slightly to get the chewiness (it didn’t include any eggs). The results were tolerable, but extremely dense–arguably an edible enima. Thankfully, Nick thinks they are delicious, so all is not lost. Two things prompted the success of my second batch. First, I had eaten some of the raw cookie dough. It was delicious, far more so than the finished prodict, and much closer to the flavor of Clif bars. Second, my mother phoned to ask for a recommendation from my No-Bake Cookie Cookbook (all of the recipes are cooked in minutes on the stove as opposed to baked in the oven). This got me thinking about no-bake cookies in general. It was shortly thereafter that I had my lightbulb moment: Clif bars may be cooked, but I was pretty sure they were not baked. So I went back to the drawing board and, using some of my no-bake cookie recipes as reference, concocted a no-bake Clif bar. Yum! While not exactly the same, it is pretty darn close. Plus it’s far less expensive–and no yucky aftertaste. Enjoy. 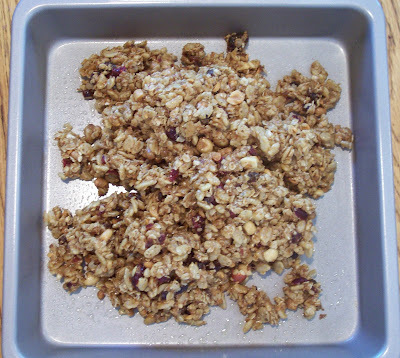 Combine the rice cereal, oats, flaxseed meal, dried fruit, and nuts in a large bowl. Combine the syrup and nut butter in a small saucepan over medium heat, stirring until melted and well-blended (alternatively microwave in small microwave-safe bowl 30-60 seconds until melted). Stir in vanilla until blended. 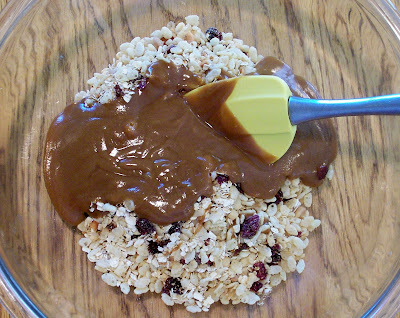 Pour nut butter mixture over cereal mixture, stirring until coated (use a wooden spoon at first, then get your hands in it. It will be sticky, but this way you can really coat everything. Just scrape off your hands when you're done). Press mixture firmly into an 8-inch square pan (sprayed with nonstick cooking spray) using a large square of wax paper (really tamp it down). Cool in pan on a wire rack, then chill at least 30 minutes to help it set. Cut into 12 bars. (Wrap bars tightly in plastic wrap and store in the refrigerator). Will You Cherry Me? : Use chopped dried tart cherries for the fruit and lightly salted roasted almonds for the nuts. Use any nut butter (almond butter is great, but I know, a bit pricey--but worth it! ), and add ¼ teaspoon almond extract. Apple Pie: Use chopped dried apples for the fruit and rice syrup or honey for the syrup. Be sure to add the cinnamon option, and use toasted walnuts or pecans for the nuts. Chocolate Chip Cookie: Replace the dried fruit with an equal amount of semisweet miniature chocolate chips (or cacao nibs, or carob chips). Combine the cereal mixture with the syrup mixture, then let the combined mixture stand 10 minutes before adding the chips. 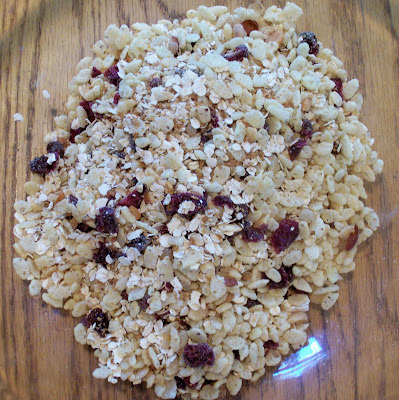 Pepita-Cranberry:Use chopped cranberries for the dried fruit and raw pepitas for the nuts/seeds. Use either honey or brown rice syrup. Peanut Butter Cookie: Use chopped dates for the dried fruit and dry roasted peanuts for the nuts. 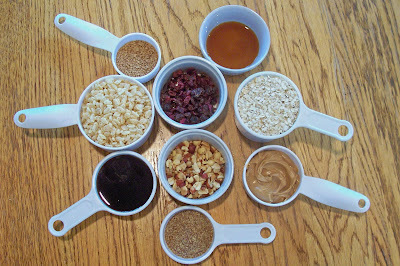 Use honey, or half honey-half molasses for the syrup and peanut butter for the nut butter. These look SO good. I’ll definitely be making them for my 4th of July camping trip. Great idea! Very cool, Amy! I envy you the camping trip, I love to camp. Have a great time! Is there a way to make these without nut butter. I am not a fan of the flavor of any of them. I would love a snack like this, just not the nut butter flavor. Good question…hmm…the nut butter really works like glue here, so it would take some experimenting on my part. What about tahini? Do you like the flavor of it? It is really mild, but a wonderful sesame flavor, and yet still has the properties as a natural nut butter. I think that would work beautifully. You may want to check out my recipe for LARA bars (I have a link within the body of my post above). They do not have nut butter, and I list lots of flavor combinations. I just made a no peanut butter version that turned out great! i warmed 1tbsp coconut oil, 1/2 cup honey, and 2/3 cup evaporated milk to a boil, reduced to simmer and cooked 5 min, stirring constantly, until the mixture began to caramelize. then removed from heat and added vanilla. Stirred into dry mixture. really stirred it in good and its yummm! I used sunflower seeds instead of nuts and added golden raisins and lemon zest as the fruit plus 1/4 cup shredded coconut. I call them lemon sunshine bars! Your variation sounds fantastic, Amber!!! Do you have any hints about storing these? They would be great to have on hand for a snack on the go, or a long bike ride. My apologies! I read the recipe closer and saw that you recommend wrapping them and storing them refrigerator. I wonder how they would freeze? Funny you should ask about the freezing becasue I was curious about that, too–it’s so hot here in Texas in the summer and power bars tend to melt in my bag (even the more grnaola-like ones get goopy). So I froze 6 of the bars (individually wrapped, tightly, then placed in a freezer zipper bag). I popped one in my person (still frozen) and it was great; only took about 30 minutes to thaw, it was still cool after an hour. I’m not sure about long-term freezing; I dodn;t know how well the rice crispies would hold up, in particular. But defiinitely for shorter storage! Great! Thanks for sharing that! Eek, thank you for pointing out the error, Priscilla. It was a clerical error–I’ve made the correction! Your comment of “meat emergency” had me cracking up at my computer–I’m going to have to borrow that! These bars look amazing! I’ll have to try them out soon, bet my boys would love them. Great post! I’m having fun playing around with variations of these. One question though…why are quick cook oats (instead of regular rolled oats) used in this recipe and other similar recipes? I believe that quick oats are cut finer so they will cook quicker. In recipes like this, they are softer and can be digested easier. I googled Cliff bar recipe and came across this post of yours. Am bookmarking it and will be trying it out soon! Thank you for posting this recipe! How long do you think they will keep in the refrigerator? I am SO glad I just googled homemade Clif bars. I’m headed to the kitchen to make these right now and I can’t wait to explore your blog some more! This recipe is fantastic! It did take me several tries to figure out why my bars weren’t sticking together – the key is to make sure the brown rice syrup, or whatever sugar you’re using, comes to a boil first before adding the dry ingredients. For some reason, this makes the syrup harden better to hold the ingredients together when cooled. What would you store these in? I want to make lots of these for upcoming hiking trips, and Clif Bars were getting kinda hard on the wallet. Just made a batch! Cherries, cranberries, and mixed nuts…awesome. Definitely worth a try. Got the brown rice syrup and used both Almond and vanilla extract. Not a cliff bar, but better, fresher, and cheaper. Thanks for the recipe. Will keep experimenting.Blueberries next? I’ve tried this recipe as well. The flavor is fabulous, and the family gobbled it up, but we had to eat it with a spoon, like granola. It crumbled when trying to slice into bars. I did bring the sugar to a boil (using honey) but it just didn’t seem to get the mixture wet enough for it to stick together. It was very dry. I had the same experience as WildSaffron…I did boil the liquid, but it wasn’t gooey enough to really solidify the bars into bars–more like crunchy snack granola or something, and they are very dry, not soft like Clif bars…would welcome any suggestions! I think that I may be having trouble because the oats I used are not quick-cooking but old fashioned. I’m loving the flavor, using Uncle Sam cereal, for the crisps. when i bake and their dry…adding some peanut butter might help 🙂 … or some apple sauce. Just made these bars, and they’re fantastic. I used old-fashioned oats but ran a knife through them a few times before adding them to the mix to make them a bit closer to a quick-cooking type. I imagine you could also pulse them a few times in a food processor. Most of my bars turned out just fine, but a couple had dry spots and crumbled a bit when I took them out of the pan to wrap individually. Oh well–one casualty I just ate as a snack. 🙂 I’ll probably add a bit more honey next time or make sure I don’t overpour on the dry ingredients, which was also a possibility for this batch. I noticed I had to stir it up really well before transferring to the pan, and I might stir with my hands next time to incorporate the wet and dry ingredients more thoroughly. I wondered if using all-natural peanut butter, which tends to be a little stiffer than conventional, could also have made a difference in how far the wet ingredients would stretch. Another variation–add a couple tablespoons of cocoa powder to the dry ingredients to mimic a brownie flavor! I can’t wait to try them. I just discovered Clif bars. I would like to make this a gluten free recipe. Any suggestions ?. I also can’t add the brown sugar, as I am gluten, dairy and sugar free but can add agave nectar. I can make these for my daughter. This is easily convertable to gluten-free. Use a gluten-free brown rice crisp rice cereal (e.g., Nature’s Path or Erewhon brand; they are typically in the healthy food section of the grocery store). 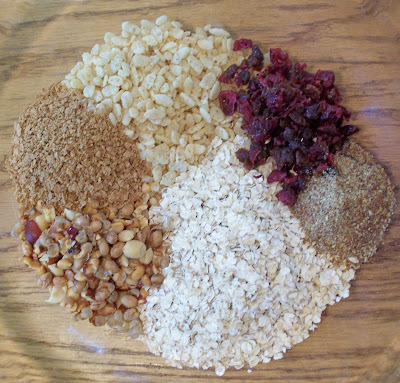 Next, use gluten free oats (e.g., Bob’s Red Mill), Give them a quick whirl inthe food processor to makechop them up like quick-cooking oats. Go ahead and just leave the brown sugar out of the recipe; it will be a little bit less sweet, but still delicious. I haven;t tried these with agave nectar, but it should be fine. Just be sure to bring the nut butter-syrup mixture to a boil. It’s really imprtant for getting the mixture to stick together. Finally, avoid ready-chopped dates as a dried fruit choice. They are typically coated in a non-GF oat flour. 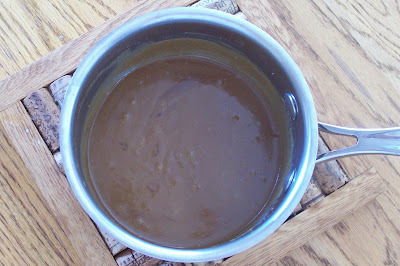 , I actually substituted the brown sugar for agave and did not have as much luck with it sticking together. However the original recipe does it say to bring it to a boil it just says the heated until it’s well Blended which are two different things. So I foolishly heated everything together on super low and doesn’t stick together. I’m going to try the boiling method next time. I ended up refrigerating my failed batch and that sort of keeps them together well enough to get them in my mouth. Thanks for recommending the boil. I don’t bake often and had no idea that was required for the chemistry to work. For the person who’s using agave keep in mind that these will still be quite sweet depending on the sugar content of the nut butter that is used. Oh I wanted to add that I actually packed mine into one of those silicone trays with the preset Square shapes. Worked really well for getting consistent shapes if you care about that. I think I will try heart shapes and such next time. Seems like these would make good gifts if I can get the next batch to stick LOL. Sorry for the weird typos I’m dictating and Google is not doing that great of a job. Clif bars are delicious. I’m really excited to try out this recipe. The only thing that’s a downside is there isn’t much protein in them (as far as bodybuilding standards). I’m going to try adjusting the ingredients just a smidgen. I just made these and they are so yummy! I also wondered how I might increase the amount of protein by adding whey protein powder, but wasn’t sure if anything needed to be increased or decreased; or at what point I should do it. This is a great find for being on clinical rotations. Do you have an estimate on how much cheaper it is to make it rather than buy it? did this recipe change? it used to have measurements for brown sugar and some sort of honey/molasses combo. could you please post those again? i’m not interested in finding brown rice syrup. thank you. looks so yummmy! thanks youre site is great! kudos! I am going to try this with nutella tonight mmMmm. Thanks! Overall, a great recipe. I’d recommend reducing honey significantly if replacing brown rice syrup, especially if you add anything else that’s sweet. I made the basic recipe with honey and raisins and it was WAY too cloying for my taste. But these bars have a GREAT consistency and flavor otherwise. I will definitely be experimenting more with this one. Anyone tried adding other ingredients like bran or germ or other grains to up the ante? Just made a variation for cycling and it’s now chilling. Here it goes: replaced rice syrup with maple syrup; lessened the almond butter from 1/2 cup to 1/4 and added an extra 1/4 cup maple syrup (don’t want too much protein during exercise); used sesame seeds for the seed; used dates for the dried fruit. One last thing. Didn’t have rice cereal so I crushed up some multingrain oatbran flakes. Will let you know how it tastes! Taste fantastic but crumbled apart in my cycling jersey! Any suggestions for better “stickage” or is this inevitable? The photo of the dry ingredients seems to have an extra one not listed in the recipe? Haven’t tried mine yet–they’re in the fridge! I made these yesterday morning for breakfast. They barely survived one whole day in our house! I really liked how quick they were to throw together. Thank you so much for this recipe! Thanks for this recipe! Im so glad i dont have to pay $1-2 for a good energy bar anymore. For my first batch i did it exactly as the instructions said, but i found it to be too clumpy and not malleable enough. So i tweaked it to 2/3 cup peanut butter and 1/2 cup honey and it seems to be holding its shape much better. I hope everyone enjoys them as much as i do! I just made these. They are absolutely incredible! I microwaved the syrup and nut butter and it turned into a liquid in about a minute and half. You have to really press down on them to get them to hold together, otherwise they’ll end up falling apart. I’ll definitely be making this again. Thanks!! Excellent recipe! We’ve made these so many times, each time a little different. These look awesome. I just opened and ate a Blueberry Crisp Clif Bar and thought, “I betcha I can make these.” Thanks to your hard work, looks like I will be able to. They look amazing and I can’t wait to try all the recipes and make some of my own creations!! Hi! These are fabulous-I love the cherry ones. One note: using my food processor for the dried cherries culminated in a unglorious BLOB! Much better to hand-chop them with a good chefs knife. Thanks for the update, Misty–I found the post (they even lifte one of my photos with my kitchen table and spatula–very uncool!) I’ve left a note. Do you happen to know the approximate fiber countof these recipes? I am looking for recipes for my son who loves the outdoors, but had his colon removed so everything must be low fiber – real challenge for an outdoorsey teenager! Thank you. The mixture was fabulous and I’ll definitely make it again! They didn’t work as bars for me though, and I’m not sure why…too crumbly. Thanks for the recipe! I made these this morning before going to work, and they turned out great! I used about 2 tbsp. extra of honey and a little more dried fruit. I’ve been making these bars now for at least 6 months. They are much loved by my whole family. And yet I never thought to thank you. How is that possible. Well, thank you SO MUCH for sharing this recipe. It’s really added a lot to our small culinary world over here. Hello Camilla! I wanted to thank you for this recipe! I recently made them and in one weekend they were all gone! I even had doubled the recipe! Very delicious, perhaps even more than the real thing! Also, my fiance eats very healthy and does not eat much sweets. His birthday is in May and I would love to make him a super healthy cake. Do you have any suggestions? Thanks so much! Just another big thanks for this recipe. Made them this weekend and my husband and I are both very impressed in how they turned out. So tasty and so easy! I couldn’t find brown rice syrup so had to improvise, but I think it still worked out OK. Cool, Jesi–thanks for sharing the link to your blog, too! thank you!!!! We like your ‘lara bars’ recipe too, but this one is a definite hit with the kids and I love that it doesn’t have soy protein powder in it. We add choc chips and a few TB cocoa powder and they go so fast! Thanks! Thank you, I love cookie dough and now I can feel good about it and give some to my kids. I will be making this tonight. I would have never had the time to figure out the recipe, as I like the concept of the Clifbar but don’t like the aftertaste. Your recipe sounds absolutely delicious. how long do they keep and would you recommend refrigerating them or do they not need it? could I substitute hemp hearts for some of the oats to boost the protein? I also made the peanut butter cookie version. unlike real clif bars (even though I love clif bars) they actually taste like what they’re supposed to taste like… real peanut butter 🙂 genius! thanks again so much!! I can’t wait to try these! Thank you, Cmailla! Have you ever tried ProBars? They are my favorite and have everything under the sun in them, but they taste so good. If you try them and gind a way to make them at home, I’d love to know how! I made these today….so delicious! I’m so excited that I can make my own now too! I can’t find maple or brown rice syrup at my local grocery store…..any suggestion for honey substitution? Thanks so much, anonymous! No worries–I am not offended by corn syrup. People have gotten a bit silly about it. I understand the concern in packaged foods, but for home baking and cooking, it is a tried and true ingredient. Not sure about buying brown rice syrup locally, but you can get it at Tropical Traditions online. I just bought some today for 35% off. Still have to pay shipping, but… easy to find. Just FYI if you can’t find it. I’m looking forward to making these as soon as my BRS comes in!! Thank you for all your recipes. I just made the cliff and lara bars today. I am over the moon with your recipe for the trio bars. I can’t wait to search your blog more. wondering if you’ve figured out the nutrition of these? cals/protien/fat,etc. Thanks so much for sharing your calculations! I love lemon zest Luna bars. They’re such a great flavor. Do you think there’s anyway this recipe could be adjusted to that flavor? I made these today and they came out perfect. I couldn’t find anything in the store that said nut butter so I just used organic peanut butter. Looking forward to making the Kind bars. just the recipe i have been looking for! definitely making these this weekend! As far as not using “nut-butter”, and I know it is made from hazelnut, but has anyone tried using Nutella? Think I am gonna try to see if that would work well..then not use chocolate chips for a less fat/sugar option? Thanks for the posts they were interesting to read, as this will be my first batch. I tried making this today and had mixed results. The good: The combination of dry ingredients works really well. I could eat this as a plain old bowl of cereal. The bad: The mixture didn’t actually stick together into bars. 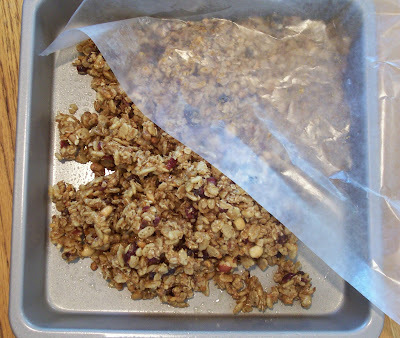 It crumbled apart in the pan as soon as I cut it, and I ended up with cold, clumpy granola. It was tasty granola, so it didn’t go to waste, but I was hoping for an actual bar. If I’m going to eat something granola-like, then I might as well just make granola since that doesn’t require storage in the refrigerator. I am definitely going to make these, clif bars are WAY to expensive. I like the option of adding chocolate to it because I have a sweet tooth! I was wondering if you can use chia seed instead of flax? Would the chias penchant for creating goop mess up the texture too much? I just made these… AWESOME!!! they are so good and my family is going ga-ga over them. We used sun butter and doubled the recipe. Thank you for saving us a ton of $$$ on store bought cliff bars! whoo hoo!!! Sabrina! I am so happy! We make power bars all the time here, too–such a big savings, I agree. Ooh, and I am CRAZY about sun butter, too. Especially the chunky. Crazy delicious goodness! I have a question please…I LOVE these Clif bars so much that I actually gained 10 lbs within 3 months and did not even realize it until a few days ago. My favorite is the Chocolate Brownie, here is the question, does anyone know of a recipe that matches closely with this bar with LESS calories and sugar. I have to admit, I am an addicted to these but need help reducing and making my own. Now I have to go and lose the 10 lbs I gained from these beloved bars, what’s a girl to do! Any help, thanks in advanced. Wow! Thanks for posting all these recipes for cliff, Lara, ect. Bars! I am looking forward to trying them! Do you know of a good substitute for the oats though? I am new to gluten and dairy free and just found out I can’t handle oats well either 🙁 thanks again for the started ideas! Twice I have tried doubling the recipe and putting in 9 x 12 pan. The bars fall apart. What am I doing wrong? I am also looking for a recipe for Fiber One Muffins. Was told to buy Krusteaz Bran Muffin mix. Have searched and searched and cannot find any bran muffin mix!!! Hi Carole! So sorry you are having trouble with the recipe. Do you mind my asking whether you are making any substitutions of any kind? Or what kind of nut butter and syrup you are using? That could help me figure it out. This is one of my go-to recipes (for years) so I would love to help make them right for you. Krsuteaz brand brings back a lot of memories–my mom used their mixes a lot when I was growing up, they are very good. Here is thier website: http://www.krusteaz.com/muffins-and-crumb-cake-products-89 Looks like the have an oat bran and a raisin bran muffin. I found a bunch of mail order places that carry both (googling) but you could contact the company, too, for stores that carry the mixes. Cheers! My son is in his second year of college. He has 2 days of classes that he barely has any time to eat. so I found a few recipes on pintrest and made him some. He loves this idea. we are experimenting with a vacuum seal bags. I put 4 energy balls in a bag not much bigger than a snack bag and vacuumed all the air out or at least most of it . I sent them to him and it’s just been about a week. He put them in his fridge at college and n those busy days he garbs a pack or two and starts his day. I was hoping this would keep them for 2 weeks. so far so good. he will be home this weekend and we will discuss this method. I can’t see any reason it won’t work. i’ll post back and let you know. Oh, that makes me so happy Kathleen! 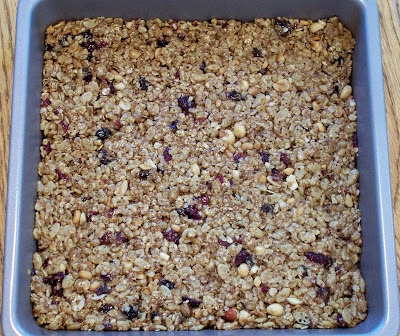 Homemade power bars sustained me though grad school–so glad to pass along the love! I tend to break my wallet because of these yummy power bars so really, thank you for all these amazing recipes!! You are so welcome, Kevin! These Energy Bars are the BEST! I have a case of Clif bars in the pantry that have gone untouched since I started making these bars! My first batch was crumbly but I loved the taste so I made a few changes. I used almond butter (much healthier) with maple syrup and some organic coconut oil – a little more than the recipe calls for of each. Also, I put the nuts and raisens in the food processor with 1/4 bar of Green and Black 85% dark chocolate; this makes a perfect consistancy to be added to the mix. The recipe is always doubled, cut up into 14 bars and individually wrapped for easy to go snacking! Thanks for sharing! You are sooooo welcome, Sonya! Love the sound of your changes! Christine, I’m so glad you liked them! I have made them with tahini with great success, so go for it! I’ve also used sunflower seed butter (brand: SunButter)–super crazy yummy. Rolled Oats, almond shavings, dried cranberries, sunflower seed butter (I don’t like the taste of peanut butter and this was the least expensive spread we could find) and honey. I added some whole flaxseed because we had some in the cabinet. I’ve been making these every Sunday for a month since finding the recipe…so much cheaper than buying 2 boxes of clifbars a week for my boyfriend and myself…not to mention we both (and all of my friends) think they taste much better. I can’t wait to look through all of your other recipes! Hello, thank you for this recipe! I plan on making these for my son as a daily afterschool treat. How long do they last? One week, I hope! I made the cliff bars with 2 of my home economics classes today and everyone loved them.. /great combination of nutrition and low cost.. Does anyone have a nutritional breakdown for the 12 seervings? Yeah you can use seed butter such as tahini or sunflower seed butter. A bit harder to find but definitely around the place. Try organic stores if your stuck. My husband hates clif bars and I just recently discovered them lol. I just don’t like paying $2 a bar almost. I’m currently breastfeeding my 6 month old and everything in this is great for keeping supply up. I did add a tablespoon of brewer’s yeast to it to help with supply but omg so yummy! I decided to make these because I already had everything in my kitchen. Whipped them up, and had hubby try them. He loves them! 🙂 I’m going to have to make a few batches now. Thanks for your recipe! These are good, but in no way whatsoever does this recipe produce 12 servings! I had to double everything just to get 9 bars of the same size as Clif brand. Although these taste great, they don’t have the same consistency as Clif bars. Mine turned out much crunchier than a Clif bar. I think next batch I will try less Rice Krispies and peanut butter, and use more syrup and oats. Thanks for the recipe…it’s nice to have a snack without all the additives! Hi! Gosh, I am not sure why they came out crunchy. Perhaps the peanut butter you were using was a bit dry? They should definitely have a texture akin to Clif bars. I do appreciate this blog and the guidance. Thank you. Hey does vanilla extract help act as the glue to hold everything together, or is it more of a flavor thing? I notice a lot of bar recipes have that ingredient. Do you think these would hold together well if I made them into balls rather than bars? I’d like to have a health snack for my kiddos, and I think a ball would be easier for them to handle. Is this cheaper than buying the bars on the retail shelf? Can anyone think of a good substitute for oats in this recipe? I’m so excited to try it, but hubby is sensitive to oats. Any suggestions appreciated! Hi Shannon–have you ever tried quinoa flakes? They are hard to find in the store but you can order them from amazon,. They are a great sub for oats in all baking recipes! Also, Eden Foods makes rye flakes that can be subbed for oats. Hope that helps! Thanks for the recipe! I’m looking forward to trying it out. Also, I noticed a nearly-identical, if not entirely identical, recipe on food.com. I hope they didn’t steal it from you! THESE ARE GREAT! I didn’t have flaxseed meal but I did have flax seeds and we actually liked them fine. Making them again today, this time with dried cranberries and a few mini choc chips. Thanks for posting the recipe, it’s our new favorite thing. Thank you for the recipe! I was happy to find a no-bake version because 1) the oven just feels unnecessary sometimes, and 2) baking the bars seemed like it might yield something much crunchier than I wanted. I probably just over-poured my dry ingredients, but do you have an idea of why my bars didn’t hold up as bars? They immediately crumbled when I cut them. I upped the PB/honey/syrup mixture, and added some melted coconut oil into that mixture, as well as pouring more melted coconut oil atop bars after I had pressed them into the pan. For the record, I basically put the kitchen sink into these. For some reason I was very low on oats so subbed about 1/2 cup of oat bran in, reduced the Rice Krispies, used whole (rather than ground) flax seeds, used raisins and chocolate chips, added crushed graham crackers, and added whey protein for some staying power. Besides the crumble, I love these! I starting using this recipe about 5 years ago and it is the best homemade cliff bar recipe I have found.